Newspaper circulation numbers are dropping, and that makes it all the more important for media houses to succeed in converting print subscribers into digital subscribers. To provide you with food for thought, we’ve examined no less than 159 newspapers' ePaper to find out which methods the best in class make use of. The basis for comparison is something we at Visiolink like to call ePaper penetration. Basically, it means the ratio between print circulation and ePaper downloads. The top 30 has an average ePaper penetration that’s an astonishing nine times greater than the bottom 30 and more than twice the overall average. 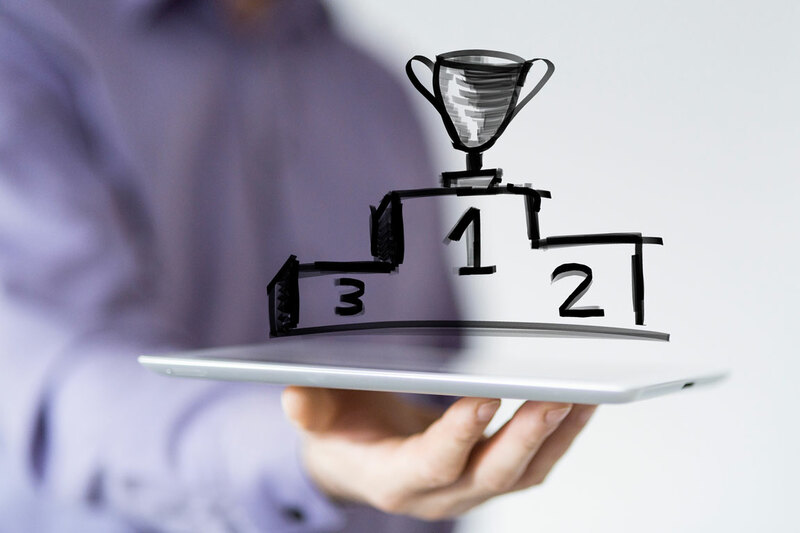 We analysed the tactics of these top of class ePapers and identified four key findings, you can take inspiration from to improve your ePaper's penetration. It may not surprise you that advertising means a great deal when it comes to selling your ePaper. Nevertheless, 70 % of the top 30 has a clickable front-page ad for their ePaper that leads either to validation or straight to today’s newspaper. This is a great way to attract readers online who are not specifically looking for the ePaper and therefore might not have noticed it before. 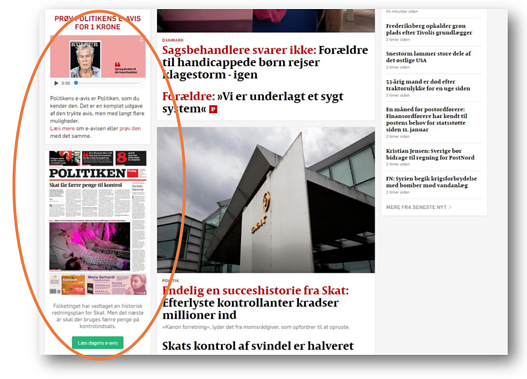 Screendump form Danish news site Politiken.dk which clearly shows the ePaper ad on the left side. Allowing free access to the first or a few ePaper editions makes real good sense. You might even call it a trial period as it gives the reader first-hand experience with your product. Experience that could very well tip the balance when they decide whether or not to subscribe to your ePaper. Paired with an introduction period at a lower price, the reader is more likely to be convinced and continue their subscription. There are many ways to work with this feature and tracking will help you find out precisely which setup your readers react positively to. Tracking is one of the main benefits of the ePaper as it enables you to act on data. Read more about which metrics you need to track. Having archive access affects your ePaper penetration in a positive way. It creates an opportunity for readers to dig into the archive and find old news gems, or find news relevant for the specific user. Giving access to your archive increases user satisfaction and results in more downloads for your ePaper, which are key to a sustainable business. Read more about the huge potential of digital archives. Svenska Dagbladet recently launched their archive, which dates back to December 18th, 1884. The archive contains more than 1.5 million newspaper pages, digitized and ready for use. 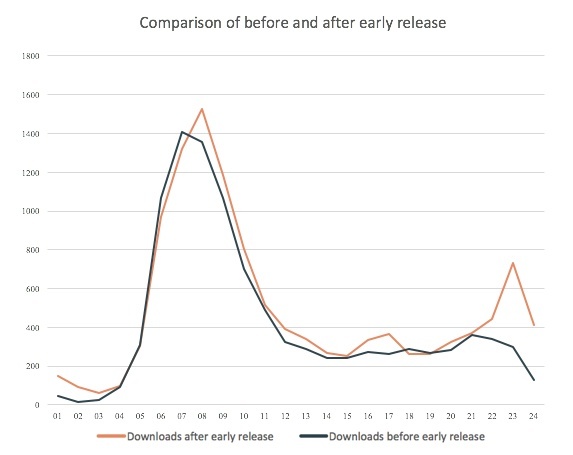 As seen in the graph below, making your ePaper available the night before has shown a second spike in downloads around the early release and a slight increase in downloads the morning after. The graphs shows an undisclosed ePaper's amount of publication openings (downloads) at a specific time of the day. 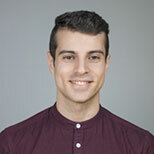 It's the accumulated result of a period of 30 days before and after changing the time of publication. It's important to clarify that the above figure is merely an example. It isn't certain it will apply to all, but early release generally moves readers and activate them to read the ePaper during the evening, without losing much of the morning activity. Early release, consequently, increases overall exposure to the editorial content as well as commercial advertisement. This feature is a great idea to pair with push-messages to let your readers know when the ePaper is available for download. If you want to learn more about how you improve your ePaper and how to increase its performance, feel free to get in touch with our Business Consulting department or contact me directly using this email: dro@visiolink.com.